Beautiful and majestic, the Whitetail Woods is finally allowed to be itself without any other geographical feature drawing your view. The trees, the songs of the birds, it all flows around you as it has this whole time, finally without distraction. Sadly, tree sap also flows around you. Can you keep yourself centered despite the beauty of the Whitetail around you and avoid the tree sap, or will this remain a sticky situation? OOC: After your first post, I roll a dice. There is a random chance you run into some tree sap! If you do, creative solutions may lead to you getting right back on track. While the Joint efforts of Taira and some of hte other races came a bit late to help out some... it turned out the team did at least manage to help 'Dark Strife' out of the caves. Once he was out and Ra-ra and Applejack came around to inform the crew of their efforts, Taira broke right back into his gallop. "Great job, Everyone!" Now with the last pony out they could get back to the fun, "Let's show these leaves whose boss!" Mist evaporated from the arch, removing the support and letting nature take it's course while everyone pushed on with their own. With Gummy on his back, and Bandit at his Horns, the kirin charged forward. All the while he carefully maneuvered himself ahead of at the very least Hawke. He wasn't about to let her use him as a springboard again either, so he put a good degree of distance between him and herself. He didn't allow his mind to linger too long on this silly rivalyry between him and her as the oncoming beauty of the Whitetail Woods soon caught the kirin's attention! Ears perked tot he sound of the birds singing their song... and his nose twitched as he noticed a strangely familiar, sweet scent. Was that honey? No, this was wasn't as sweet smelling: it was sap! It was strange to see just how much of it was flowing. Taira had to stow his curiosity for the most part and try to focus on Dodging these puddles of stickiness! The pack quickly entered the ‘Whitetail Woods' section of the race. Fire Walker could not help but feel a little on the paranoid side. Something silly was going to happen! This forest was probably the nearest area one would call the direct opposite of the 'Everfree Forest'. While the dark forest was home to all kinds of dangers and darkness, the 'Woods was as safe as they get. The Whitetail deer did a pretty good job at keeping the spooky and weird away from their tidy bit of woods. Well, maybe tidy was not a good word to use as there was a good deal of free sap to be seen. What in the world happened? Was there a tree-sap-collector strike going on? She would simply need to watch where she was going. Her running suit had moisture-managing Dri-FIT technology and was supposed to be resistant from water, mud, wind, and rips...But she did not believe it could handle nasty ol' tree sap. As long as she kept her eyes on the path in front of her, the sticky stuff should be easy to avoid. And this fueled her paranoia. Something else was going to happen. It wasn't going to be the sap that would try to stop her, it would be something else. Something weird. But what could it be? They had a crazy storm. Giant flying bear. Collapsing underground path that she wisely avoided. She could only imagine what was next. Pygmy ponies pouncing on pogo sticks? Dangerous dragons digging ditches? She would only have to keep running...And something was bound to pop up..
Boulder Dash followed the pack through with an extra stride in his pace. Taking the time to help fellow racers made him feel good, as in good since he was in the Navy working as a team on a ship. It was a sense of nostalgia he hadn't felt in a long time. However entering the woods he focused again trying to make sure he didn't wind up in any "sticky situations." These woods poured out tree sap like beer keg poured happiness. He watched the trees and zig zagged in around them to make sure he didn't clog through any sap. Still you never knew when you might step in something fierce, so he made sure to keep his wits about him if he happened to feel something sticky in his hooves. The Whitetail Wood provided the second most beautiful backdrop to Ponyville's humble landscape. Especially during the autumn, when the orange and red hues of the foliage reflected the lazy sun's ray onto the ground. It projected a very warm atmosphere, one that was hard to duplicate should an all-powerful pony try. It was moments like these, seeing the gorgeous view of the trees (especially after escape a few near-death experiences in a dank forest cavern), that Applejack reflected on what made the running of the leaves so important and so majestic to be apart of. She was proud. Not as proud as she was about Sweet Apple Acres being the number one most beautiful backdrop to Ponyville as suggested by the Foalfree Press, but still. As the racers got to the wood, they all weaved different directions. This part of the track was very forgiving, and offered several different trails of which there was no advantage. For now, Applejack would take one by herself to help separate from the pack. In doing this, she could focus on watching out for the hazard of the stage, tree sap. Ever since the famous Rainbow Dash rivalry shenanigans of a few years ago, Applejack has always known to be careful around this course. The harvesters that set up buckets underneath sap spigots on seemingly every tree made it very practical, but also very dangerous. All it would take is one bucket to drop and sap was everywhere. Looking ahead, she made sure that the buckets she was approaching did not have holes in them or if they were tipped. Any indication of fallen sap should be observed, if possible. "Aaaah!" Pinkie exhaled a huge breath. "This is more like it!" She gestured to the width and breadth of the path through the woods. "I love the Whitetail Woods this time of year! It's just beautiful!" Her eyes rested on Hawke for a little too long when she said the word but it was only a moment later that they flicked to the trail, trying to take in as much as she could without loosing focus on where she was headed. There was lots of sap lots of everywhere for lots of ponies to get tripped up in if they weren't lots of careful! "Wowee wow! Be careful Hawke!" She exclaimed while trotting past an extra large extra sticky puddle of sap. "I sure hope I don't get caught up in that!" She swept a hoof back through her forelocks. "It would totally mess up my mane!" 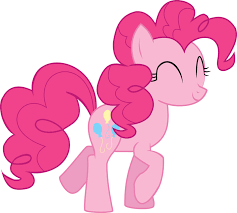 Pinkie giggled and trotted on. "I'm thinking a smackerel of honey might not hurt huh?" So far, Taira was entirely in the clear. Nimble sidesteps during his gallop let him surge past some of those ahead of him! The sweet scent in the air was practically intoxicating but with a strong will he was able to push on through and focus on the road ahead. In his efforts to keep avoiding any puddles of sap, the kirin's wake of dust and leaves would be left shifting and swaying behind him as he weaved in between obstacles without breaking his stride. The Bandit was back to holding on to Tai's horn as if he had any sort of control in this situation, Taira wasn't about to rain on a hat's parade. Gummy continued his silent contemplation... at least initially. The spaced out gator would shift and slip his head down while he latched onto his ride's midsection. Gummy left his mouth open as Taira spe along, the creature taking in a big gob of the sap in his maw. Taira's brow arched as he took notice of the gator's antics. 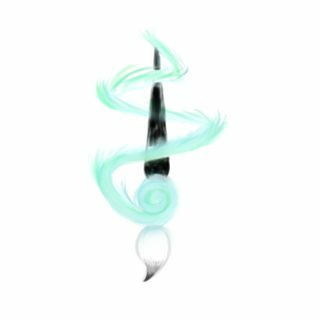 A puff of mist burst from the stallion's lips and then slithered it's way around Gummy to push him back upright on Tai's back, "Now-Now! I promised your owner to keep you safe. Stay put will you?" Gummy gave Taira the most spaced out flat look the kirin had ever seen. Not quite sure what to make of it, Taira returned his attention to the race. A second after he'd looked away he felt a strange pressure on the back of his head. The Stallion looked around back and forth, "Gummy?" While not immediately apparent to Taira, any of the other races woudl be treated to the sight of a sticky mouthed gator currently stuck to the foreigner's mane. This section of Whitetail Wood was littered with sap catchers, and although the arrangement of wild trees was not technically an orchard like that of Sweet Apple Acres, many of the paths around the woods were interwoven so that harvesters could easily walk through to get to all the trees that yielded the sweet syrup. Because of this, Applejack found herself forking in an out of common paths with other ponies. She could see around her familiar faces, soon to be rivals, griffons in love, and friendly athletes. But one fork she ended found herself running next to a pegasus pony she had not seen to this point in the race. There were lots of runners this year, but only a hooffull were ones that Applejack had seen. Having never seen this stallion before, she decided to give the gray pony a competitive greeting. "Howdy, partner. I've never seen you before. You didn't take an illegal shortcut didya?" Applejack snickered, trying to be obvious that she was joking. Ahead of them in the path were several batches of leaves, either from the wind gusts from the earlier storm, or from runners in front of them, covering possible puddles of sap. It was awfully hard to discern at times where the sap was and where it wasn't, and Applejack didn't like the gamble. "I've found it easiest to just try and always keep yer hooves on the dusty path, guarantee the grip. It might feel nice to trample leaves, with everyone bein' tired and all, but it's just not worth gettin' stuck in the sap, that raw stuff is like glue." Applejack jumped over a suspicious pile of leaves. "Name's Applejack, what's yers?" She moved past the darkness and wildness of the Roundbottom Hills and was soon experiencing the serenity of the Whitetail Woods proper. No great storms to misconstrue national beauty. No hazards to imperil the safety and livelihoods of the ponies running the race. Nothing to enchant or disrobe you away from the safety of the trails. Instead you were greeted by the gentle wilderness that defined the great Equestrian park. It was a tamed forest, a lovely. Hidden in its vastness were wilderness retreats and campsites, natural wonders well-watched. Vacation sites of royalty. All of it and more inhabited this wonderful land. This was not a place to be afraid of. Equestrians were as comfortable here as they would be in any city. Well-ordered rows of trees, docile wildlife, gentler weather (when weather teams did their job, anyway). Even Ra-Ra, far from an outdoorsmare, was familiar enough with this land to have a degree of comfort as she ran. Which was good because it was about the only thing that was still comfortable. She wondered when and if this wall that she had been told about had been conquered, and if it was supposed to make her feel as groggy and light-headed as she did. It was true that her legs felt better, more stable now. Her breathing didn't feel half-bad, her muscles not as awful. But she felt...light-headed. Short of breath instead of haggard. Her legs moved with speed and all that but she couldn't help but feel that the physical wall had been breached at the cost of any feeling later. She hoped that down the stretch she didn't metaphysically or literally collapse, but she had come too far and tried too hard to fall back now. She would continue pushing herself. Not to mount some wall but to prove to herself just what her limits were. Time would tell. Every barrier she passed through was a triumph paired with potential tragedy. Limits passed were passing limits, but the end of the line hadn't come up and the train of energy and passion that was Coloratura barreled through the course as well as it could. She was in a comfortable position. Still had a good shot. Still was in it. The field had dispersed a little and there was a clear crop of contenders, from Taira and Applejack to Ra-Ra and Fire Walker. Almost everypony was in sight, everypony could be heard. Between them and the sound of the birds in the air it was easy to imagine getting lost. It was very easy to imagine partially because she did lose track of her spacing a little Or a lot. Hard to tell. As she was taking a good look at the frontrunners and even a new pony who was pushing their way in she felt her back hoof get trapped. She tried to gallop through it but lost her hooving and fell to the dirt with a crash and an, "oof!". Twisting and getting more stuck in it sghe looked back to see now both back hooves were stuck deep in tree sap. He was far from the cause of the cave in, but the uneducated would fall to blaming his magnificent presence as the cause. Oh hardly. He wouldn't have course nor reason to alter nature which was far from the predictable measures farmer's almanacs would have you believe! Weather and soil did as it pleased and this day was no exception. The umbrella came in handy as it kept the loose and cascading debris from clunking him on the nogging. "I don't remember summoning hail..." He peeked out only for a twirl of most coming about among a small rescue party to entertain heroic endeavors. "Well, these paths are just all falling apart aren't they?" He declared, watching the racers resume after their brave hurrahs. The spirit would almost feel bad leaving his trap ahead, but he was hardly cheating. A few bent rules never strained a game, only mad eit more interesting! He galloped along, ears folding back at Applejack's banter. Indeed he was well met with luck as his distraction worked for the grey pony at the stall had a most handsome mustache! It couldn't be him! "Nay ma'am, selling honey pops! Better than any apple you've had!" And so Applejack was given the bait. They were just ordinary hardened honey candies, but a distraction enough for Strifecord himself to continue along and at least try and catch up! The handsome, mustached stallion, who looked an awful like like a certain, grey furred racer, offered Hawke and Pinkie a sweet treat. "Don't go diverging off into the sap now. I hear it's all the rage these days, kids and their hoppity hips and sticky hooves. Back in my day we walked fifteen miles to get a honey pop! Uphill. In the snow!" He rambled on in hopes of keeping them along as far as he could. Meanwhile the true, grey racing unicorn trot along in an even pace. Nice hat? Whatever could he be talking about? Then it hit him, 'Gator couture?" he'd heard that term somewhere before, "Couture... Couture... Oh! Fashion!" Taira turned his head around to try and ask what that had to do with him... but once he head he noticed a tail whipping just out of his line of sight. Now he understood. Gummy was stuck to his mane. Well It's not like there was any safer place to be in this race! Maybe his owner could unstuck the space cadet of a gator from his head. "Thanks, Hawke-san! " He called back with mirthful laughter, "I think he really brings out the color of my eyes! If you get closer maybe you can see it better!" With those competitive words, Taira would run on ahead. The wind behind him pulling leaves off the trees behind him that those ahead of him failed to get. This was really just too much fun! Surging on ahead Taira took notice of that Red pegasus from the start of the race! He pulled on ahead until he was beside her, and eventually just the tiniest bit ahead of her. "Hello again!" He called over in a chipper tone, "You enjoying the race? We're almost to the end right? I hope that stallion from before the mare in the stands were swooning over comes back soon! He seemed like a hoot!" Having never seen this stallion before, she decided to give the gray pony a competitive greeting. "Howdy, partner. I've never seen you before. You didn't take an illegal shortcut didya?" Applejack snickered, trying to be obvious that she was joking. Ahead of them in the path were several batches of leaves, either from the wind gusts from the earlier storm, or from runners in front of them, covering possible puddles of sap. It was awfully hard to discern at times where the sap was and where it wasn't, and Applejack didn't like the gamble. "I've found it easiest to just try and always keep yer hooves on the dusty path, guarantee the grip. It might feel nice to trample leaves, with everyone bein' tired and all, but it's just not worth gettin' stuck in the sap, that raw stuff is like glue." Applejack jumped over a suspicious pile of leaves. "Name's Applejack, what's yers?" Heart Shield galloped along at a brisk pace, churning the leaves around him as he went. He loved the peacefulness of the woods from being in busy Canterlot for once. The trails had mostly been quiet, he could see ponies ahead, but no one behind him. All tho he had been focused on not getting stuck to really notice to much. The path he had chosen wasn't the best. The leaves covering the ground covered the sap puddles, and the leaves themselves where a little slippery, Almost causing Heart Shield to go for a tumble a few times. When out of nowhere he heard the sound of pony galloping behind him. glancing behind him he saw a orange colored earth pony closing in on him. "Seems I must be slowing down a bit" He thought to himself as this pony galloped up along side him. The pony asked him if had taken an illegal shortcut. "I hope not!" He said as he carefully avoided a puddle that was almost directly under him. The earth pony gave him a bit of advice and introduced herself. "Thanks for the tip M'lady!" He said glancing over, but trying to focus on not getting stuck at the same time. "Its nice to meet you Applejack!" He exclaimed. "My names Heart Shield, I used to live in ponyville before i moved to Canterlot a few years back" He said to Applejack returning the introduction. "I would have joined in the race earlier, but I was stuck at my post in Canterlot for awhile, but i finally got a few days off!". He said trying to explain himself from earlier when she had said she had never seen him before. "It sure is beautiful out here isn't it?" He added taking in the scenery. It was nice to have someone to talk to now. Heart Shield seemed a little baffled that Applejack had run up next to him. Did he not know that she was the best athlete in all of Equestria? Was he unaware of the tribulations this orange earth pony had overcome over the years, becoming the pony embodiment of honesty and the value of integrity? Was he blind to how great-tasting the apples from Sweet Apple Acres was!? Nah, he probably knew. Especially since he mentioned he used to live in Ponyville. He said he had to join the race late, but did not regret a chance to see the wonder of the running and the scenery it went through. "Darn tootin'! Half of what makes it so much fun is seeing the colors and the community that comes from the event." Applejack noticed ahead, a large puddle of tree sap in the way. There was no path around to help skip around the sap, and the puddle was too large to try to jump. However, there was a rocky natural wall that was along one side of the where the puddle was that she could use to avoid stepping in the sap. It would require some agile moves and some energy, but Applejack knew she had it in the bank. But could her running partner do the same? He looked strong enough, but could he parkour with the best of them? "Hey, Shield. Think you can follow me?" She asked with a competitive attitude. Applejack leapt to the rocky wall and started running sideways on it for a long second before gaining leverage to jump off the wall and back onto the dirt path, just passed the sticky sap puddle. Right as she turned the corner after the sap puddle, she noticed another gray pony, this one a unicorn, who had a chaotic look in his face selling treats. Before she could analyze who the pony was, she questioned the very existence of a treat stand in the middle of the woods. "You sellin' Sapcicles?" "Nay ma'am, selling honey pops! Better than any apple you've had!" Applejack's pride section of her mind was immediately twisted. "Better than. What!?" 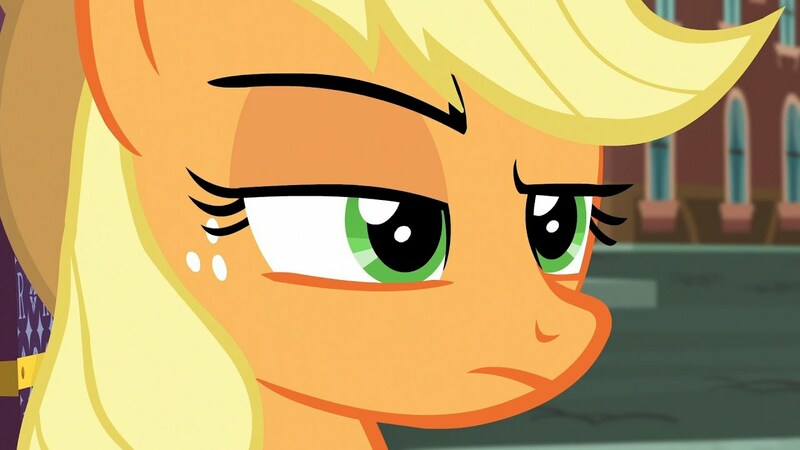 Applejack's eyebrows alienated each other, as the annoyed look on her face was tense like a rope holding back a viscous feral bull. "That's nice," she replied calmly. It had occurred to her that the pony seemed strikingly similar to the ponysona Discord was trying to run in today's race. And although she was still really upset by the audacity of his implications of the inferior tastes of apples, Applejack decided it wasn't worth it to give the spirit of chaos exactly what he wanted. Applejack chuckled as she brushed it off her mind and muttered to herself. "You'll have to try harder than that, Discord." The Ponk's gaze shifted from dreams of honey pops to the trail just behind them where, if she judged the noise correctly, a pony had just hit the dust! "Ra-Ra!" She clapped a hoof over her muzzle. "Oh my Celestia!" She pranced in place as her eyes roamed over the sticky situation in front of her. "You look super duper stuck! Are you ok?" Ra-Ra tried to move both of her back hooves and found herself wanting for strength and a time machine to go back about twenty seconds. She had neither though and would have to settle for Pinkie Pie which, as consolation prizes go, was quite good. "Well, by my stars and garters...yes, it appears as though I managed to get stuck. How embarrassing," she sighed, still struggling in vain. Lack of effort was a worse sin than lack of ability, after all. "Don't worry Ra-Ra!" She dropped to the ground in a puff of dust, suddenly decked out in camouflage fatigues. "I'll be there in just a sec!" Pinkie hopped over a large puddle of sap and skirted a few smaller ones, putting her right next to the stuck pony. "Ok! Made it!" She grinned but then the grin fell away. "Now....how to get you unstuck..." Pinkie glanced about, looking for anything that might aide her efforts. Ra-Ra watched helplessly as Pinkie Pie disregarded casually any sane laws of physics as was her reputation and got a new outfit prepared. She was soon off to the races so to speak, appearing near Ra-Ra and getting to work trying to find a way out. The mare wasn't entirely certain if there was an easy, non-messy way out of it. She had certainly managed to do a number getting stuck in there and wasn't confident that just anypony could find a solution. But she was sure about one thing. "With how fast you are able to change outfits and get them in any situation, I'd think you could make a killing being a costume designer on a projector set. Ever considered show business?" Ra-Ra asked in order to lighten her mood, which had been edging towards worry as time melted away. "Oh, I've taken a turn or two with show business! Obviously you've never had the pleasure of watching my performance of 'Oink-Oink-Oink'! The costuming on that's a crowd pleaser for sure!" She tapped her muzzle. "Welllll, it's a crowd pleaser for fillies and colts below the age of one!" She giggled. "Nah, it's enough to be the biggest party pony in Ponyville!" "Ah!" She reached behind her. "How could I forget!?" She whipped out the party cannon! The party pony positioned the weapon of elation next to Ra-Ra in her stuck position. Next she quickly shimmied herself halfway inside the cannon and reached out to Ra-Ra. "Okie Dokie! Just hold on tight and we'll have you free and back on the trail in no time!" It was a bit of an odd plan and of course had its shortcoming but perhaps it would work? Ra-Ra had never seen the party cannon. Indeed, she had seen only one cannon and that was on the set of some REA recruitment shoot. When Pinkie Pie started to set it up the songstress went through a range of emotions, most of which could be read plainly on her face. Confusion begat fear which begat panic which begat understanding once she saw Pinkie Pie climb in. It was beyond unorthodox and she was sure that a purist may consider it cheating but moments in time were fleeting and wasting them stuck in tree sap seemed like an abuse of the idea. "Pinkie Pie, are you sure this is really-" she began to ask, looking for anything to hold on top before she was cut off by Pinkie and the shenanigans continued. "Just hold on tight!" Pinkie restated. She was used to unsure reactions from others when it came to her trusty cannon."Three..." She reached back and lit the fuse. "two..." Pinkie laughed. "Whose ready to party? One!" Streamers and confetti rained down. 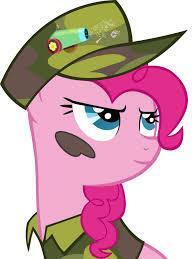 The blast shot Pinkie forward. Hopefully Ra-Ra could hold on and go along for the ride! The two sailed through the air and Pinkie cheered as the sap strands snapped away from Ra-Ra's legs! "Woo Hoooooo!" Across the puddles of sap they flew! Once they neared the trail Pinkie started a tuck and roll. "Not my first time being shot out of a cannon! Just hang on Ra-Ra!" They rolled once, twice and then stopped. There was still some sap around but Pinkie had managed to un-stick her friend! "Thank you for choosing Party Cannon Express! We hope we have met all your unsapifying needs!" Taira whistled as Pinkie Pie and Coloratura soared overhead! Such ingenuity in a small pink package... he'd have to keep an eye on this one. For now though he was more than happy to just voice his admiration with a whistle, "Pinkie-San! I never knew earthponies could fly!" Noticing the pair of flying equine's trajectory, Taira scooted over to the side to make some room for them. Once they'd landed back on their hooves, the kirin would smile over to the mare. "Sooooo, Pinkie-san..." The Stallion turned around to flash a sly looking smile while the gator was still stuck to his man, "Like the new hat? He compliments my eyes doesn't he? ... Somehow I think he'd look much better in your mane." 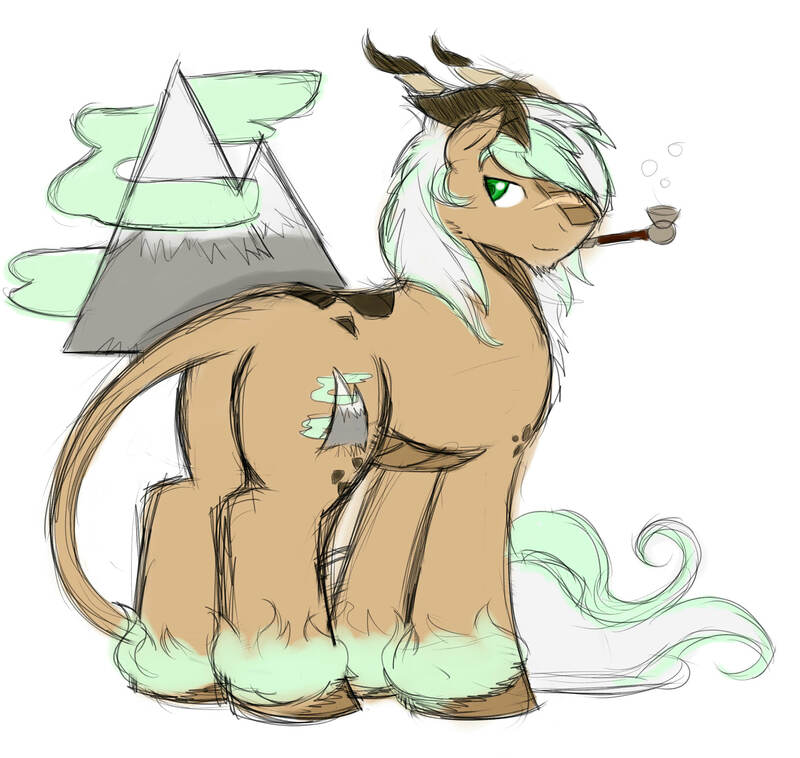 A deep breath filled the kirin's lungs and he exhaled another stream of mist that stretched out in ribbon's behind him. The streams of minty mists would soon roll up back towards their maker and gently try to tug the gator off his head. Taira flinched as he felt a sting of pain around his neck when he pulled. To absolutely noone's surprise but Taira's, Gummy was very thoroughly stuck in place. With a nervous smile he turned to the pink pony, "Don't suppose you have any methods that get this little guy off me?... preferably not another cannon if you don't mind." It was rather easy to avoid the sap. One would have to be an actual sap to get stuck in it. Just as long as you kept your eyes open and there were no distractions, avoiding the big blobs of tree resin was easy peasy! This was one of the many things one needed to do when running. Avoid stupid traps. As Fire Walker raced along the path, she noticed a slightly familiar sight. It was a stallion named Heart Shield. She came very close to training the young pony, but had been called to Phillydelphia to aid two ‘professional monster hunters’ rid the sewers of a few rather pesky beasts. The officer started to open her mouth to give the guard-stallion a proper greeting, but missed her opportunity when he zoomed right by her. Well, maybe it was proper the best time to start moving a little faster. As she broke into a faster gait, she started to run alongside the kirin who managed to catch up with her. This was not helping her self-esteem. He had a few words with her, and Fire being the ever polite, Canterlot pony had to reply. "It's been interesting. ", she managed to leap over an small patch of gooey sap. "I'm a little worried about the poor condition of our track. ", she sighed, "Will get with the Mayor and see what happened. Mind your left there. ", she pointed to another patch of sap along his path. Hopefully he was more agile than he appeared. The swooning stallion? "That was my fiancé...I believe he fell a little or possibly even a good deal behind...Probably to help Ice Storm..." Would she try to get her hooves on another one of her stallions? She snatched up Dunder, would she attempt to swipe Swift as well? The officer felt a little upset. Maybe she should have stayed at his side? Did the sneaky little competitive bug bite her once again? If he beat her in a race, he would probably never let her forget that!" And he said something that perked her up a little. "Yes..this is the last track before the ol' home stretch..This is when you really started to knock those leaves back! ", she added after she broke into a grin. Applejack finally noticed the weird stallion was dumb ol' Discord And speaking of Applejack, where was her companion? The poor mare was stuck! Somepony should probably help her...And Pinkie had a cannon. Where was she keeping that thing? "Come on! ", she called out to the stallion, "We can rush ahead....If you can keep up, I'm sure the silver medal will look good on your coat....Even match your cutie mark!" Applejack noticed ahead, a large puddle of tree sap in the way. There was no path around to help skip around the sap, and the puddle was too large to try to jump. However, there was a rocky natur﻿al wall that was along one side of the where the puddle was that she could use to avoid stepping in the sap. It would require some agile moves and some energy, but Applejack knew she had it in the bank. But could her running partner do the same? He looked strong enough, but could he parkour with the best of them? "Hey, Shield. Think you can follow me?" She asked with a competitive attitude. Applejack leapt to the rocky wall and started running sideways on it for a long second before gaining leverage to jump off the wall and back onto the dirt path, just passed the sticky sap puddle. Applejack had seemed a little confused that he never heard of her. He recalled that he might have been to sweet apple acres when he was young, He thought for a moment searching his memory. Looking ahead there was a very large puddle of sap that made the path itself impassible. Heart shield looked left and right considering his options There was rock wall on the left, on the right the forest was a little too dense to go around. Weighing in his options, Applejack spoke up asking if he could follow her. He watched as the pony leapt onto the wall running along it for a second be bounding off the wall back onto the path on the other side. Looking at the wall Heart Shield saw a sturdy looking branch hanging just a little higher up on the wall. He decided to pull his own little stunt. Nearing the puddle he turned to the left and used his momentum to climb up the wall in a sideways shuffle. Wrapping his hoofs around the branch he threw his weight into swinging on the branch, pushing off when his legs where almost in front of him. He was in the air for what seem a second when his hind legs landed just Inches for the puddle. Making sure he didn't fall backwards into the mess Heart Shield tucked his front hooves behind him as he rolled forward over his shoulder and back before rolling back up onto his hooves. This move seemed a tad slower than her, and she had turned the corner already. Resuming in gallop Heart Shield turned the corner to catch up. "It's not always like this?" He asked with a puppy like tilt of his head, "I've been having a blast so far! The only thing that seemed suspect was that whole... collapsing cave business... and the weird weather... and the sap... actually now that I think about, this all has been oddly dangerous for a festival!" Taira had let himself get so wrapped up in the fun of the race, he'd let his suspension of disbelief get a bit too loose. "With our luck..." The kirin's statement was momentarily stalled as he leapt over that sap patch she so kindly pointed out. "... There will be a manticore by the finish line, huh." Taira perked up at the mention of the green unicorn back in the race was actually her mate, "Your fiancee? Congratulations! From the sound of it you'll be envied by half the town. Don't suppose I could stop by the wedding could I? I've never seen an equestrian ceremony before. If he's a stallion whose so eager to help out someone in need I'd love to meet him." Needless to say, the kirin's interest was piqued. Her pointing out that this was the 'Home stretch' made him realize he really needed to kick it into high gear soon. He looked over to PInkie beside him and grinned, "Well, I think we both know I can't let her get away with that, Pinkie-san! Think you can keep up the pace and get this guy off me? Are you up to the challenge?" He asked in a genuinely excited tone as he began to pull ahead. As he zoomed on by he smiled at Rara, "You're doing great, Friend! Don't forget about that autograph at the finish line!" Ra-Ra smiled as she was helped up. "I'll have to book passage on the Party Cannon Express sometime in the future...maybe during a show. Hopefully with a better landing! Thank you, Taira. I haven't forgotten that autograph!" Having to stop and satisfy her own curiosity of the honey pop stand, Applejack was slowed only momentarily, but enough to let Heart Shield catch back up to her. She noticed him. "Oh, you made it over that sap just fine. It's nice to know I'm not the only pony here who knows how to avoid sticky situations, heh heh." She chuckled loudly at her own joke. Applejack heard an explosion behind her. She didn't know what it was, and couldn't see anything either. But then, streamers and confetti rained from the sky, and when she looked up, a pink pony and a bright blue pony were shot overheard. A pink pelt and mane could only be one pony, and unless there were other racers Applejack hadn't met yet, the other pony was Coloratura. As Appejack ran, her mind raced of thoughts of them being shot from a cannon, probably Pinkie's cannon, and then realizing the competitive advantage one could gain from doing such a thing. "'Excuse me, Shield, I gotta speed up to catch these girls, they cannot get away with that one!" Applejack picked up speed to a full sprint. The day had been very stressful, full of dangerous floodwater and underground tremors. Applejack would be lying if she said she wasn't tired, she had made good pace to this point and had done a good job of not overdoing it. And she wouldn't lie, because lying would not be beneficial or honest, especially to herself. She was so fatigued, but she planned to never let midrace antics allow her to take advantage of a situation that would not be fair to the other racers. It was boiling up inside her all race, seeing ponies occasionally using their wings for maneuvers earth ponies couldn't make. Unicorn ponies using magic to avoid contact with trees and rocks. And now even earth ponies seemed to be taking advantage of exploitive cannon power. Applejack felt like she was the only one racing fair and square, and she was not going to let it lay any longer. The rhythm of her gallop was fierce and angry. She approached Coloratura and slowed to a stop. She saw Pinkie there as well as Taira helping them both up. They seemed to be in good health. "Are you alright, Countess?" Ra-Ra had hit the ground with a bit of a tumble and then it took her a few seconds to regain her composure before getting up, dusting off, and hoping to continue to run. Her coat was dirtied and her mane a wild mess, a mix of sweat and dirt working to keep it coiled up against her coat. A few more aches and pains. Between Pinkie Pie and Taira she was quickly able to get back up to full stock of herself. "Thank you, Pinkie. I wasn't sure how to get out of that mess! Let me stretch for a second and then I'll continue to run. Can't risk getting hurt now," she said, commencing the stretching. Her muscles were taut or jello at this point, very little else. but no need to risk anything worse on account of poor preparation. Besides, it was only a few more seconds. In that few seconds, Applejack came up and asked her if she was alright. Well, she asked the Countess. That seemed weird- Applejack more than anypony seemed to hold the whole Countess Coloratura persona in a poor light. Ra-Ra didn't have time to truly unpack it though, so she gave it little thought. "I am now, thanks to Pinkie Pie. Her cannon got me out of a sticky situation," she laughed at her great pun. Stick. Sap. It made sense! Stretching done, she started a nice canter that would evolve into a trot and more soon enough. "Now come on, we have a lot of race left to run Applejack, and I haven't given up just yet!" "No." She replied sternly. "You should stop." Applejack exhaled with disappointment. "You've gotta a lotta nerve flying across the sky like that. You know very well that kind of stuff is not allowed." "Flying across the...? What are you talking about, Applejack? I-"
"You think I didn't see you and Pinkie soaring through the sky like a couple pegasus ponies trying out for the Washouts!?" Applejack couldn't believe the Countess was trying to pretend like it didn't even happen. "You've been cheatin' left and right, and I'm gonna put an end to it right now!" "Applejack, thats nonsense. Pinkie and I would never cheat! Be reasonable. 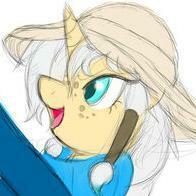 I was stuck in sap and Pinkie Pie helped me out," Ra-Ra said as she started a trot. Her friend was going to see reason, right? Applejack gave an upset chuckle. "Oh... So the only way to escape the sap was by blowing yourself by the race leader." Applejack mocked Coloratura's lack of confidence in her explanation. "How convenient." Ra-Ra was flabbergasted. After everything today she was being accused of cheating!? "I think you know how to CHEAT!" Applejack paced back and forth. "Oh, whatya gonna do now, blame Pinkie Pie? Was it the sap's fault you cheated? NO!" Applejack pointed a hoof at her. "This is on you! And only you. You didn't need to get magic help to jump the ravine, and you didn't need to persuade Pinkie Pie into launching you to the lead!" Thought Pinkie Pie was probably in an earshot, Applejack was not in a position to let the conversation include anypony but Coloratura and herself. "You're right I didn't need help to jump the ravine because I did it on my OWN. And I didn't need to persuade Pinkie Pie to launch me anywhere! She came to help me because I was stuck in sap and she's a nice pony! Applejack, I'm going to run this race. You can run or you can talk or you can run AND talk, but I am running," Ra-Ra said, losing her patience entirely with Applejack and starting to gallop. She wasn't sure what got into Applejack but it felt like an entirely different mare from the one she had thought she had known well. Furiously did Applejack chase after Coloratura. "Oh, so you're a cheater AND and liar. Great. Why not just ask Discord to teleport you to the finish line while we're at it?" Applejack overtook her and attempted to run away ahead of her. "Look at that, I'm beating you again. How ya gonna cheat this time?" Ra-Ra growled in frustration. "I haven't cheated this whole time! And maybe if you weren't wasting time back here you wouldn't be fighting for first, you'd just be in first. Then you could win this race again for who knows how many times, Ponyville's premiere athlete!" She sarcastically spat back. Why wasn't she more worried about defending her title?! Applejack's face turned to stone. Her head slowly turned away from her foalhood friend. She was hurt, but she was not done being angry. "Maybe if ponies like you weren't cheatin' every year, maybe I could actually win for once, since I'm the only pony in this galdarn race that never cheats!!" Her voice was loud enough that other racers nearby could hear the accusations. Ra-Ra was shocked, and confused. "You've never won? But...you're the best athlete I've ever seen on four hooves!" She said as she sidled up to Applejack, her voice softening. Applejack's eyes started watering, her tears only falling occasionally from the inertia of the gallop. "Um, well. You see... NO! I've never won." Applejack said with angry confidence, as if to face a fear. "And maybe I would have won in past years if everypony wasn't cheatin' all the time." Applejack's eyes fell, to the realization of her psyche. "But then, maybe that's just what I tell myself to keep from embaressin' myself." Applejack's gait slowed, her vision blur from emotion keeping her from being able to see the path at a high speed. Ra-Ra heard the words and she saw Applejack's body language. So it was true, wasn't it? More important than that, it weighed on her. She was seemingly so gung-ho, so excited, but inside her defeats had torn her up. She was a mare in need of help, and she was going to get it. "Applejack," Ra-Ra cooed softly, too low for others to hear it, "that's awful. I know how hard you try, and how hard you try while doing it the right way. You don't take shortcuts. From a mare who once took shortcuts in a career let me tell you, that is one of your most admirable traits. Today, I looked to you for guidance, and you haven't led me astray," she nuzzled her friend, keeping pace. She allowed the moment to hang. "I haven't cheated today. 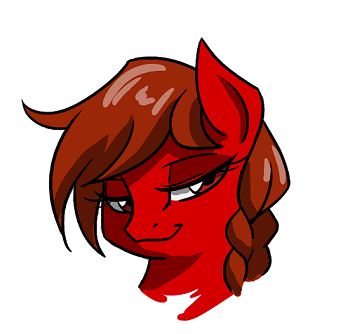 Maybe somepony in the past did, but I haven't. Maybe you haven't won before, but you can now. You can do it, Applejack, and you can do it your way. All you've got to do is get over your own wall inside," she said, touching Applejack's chest, "here, and-" she brushed back Applejack's mane to cup her head, or as much as she could, "here. Now, how about we summon everything we have left and make one last go at victory, the Applejack way?" Applejack turned somber briefly as she dug herself in her own wallow. She had accused one of her best friends of cheating, all because of what? A stupid medal? Years of running the leaves had always been fun for Applejack, and she truly enjoyed doing it, but the threat of going another year of not winning haunted her more and more as time went by. But when somepony she cared about told her how valuable she found her ability to compete with integrity, she was reminded of why she enjoyed working hard in the first place. It wasn't about winning. It was about accomplishing something to the best of your true ability, and helping others up in the process. Applejack could hear it in her voice. She hadn't willing took a competitive advantage. It was Applejack's pride that kept her from hearing the sincerity in her voice the first time. She realized she had missed the honest truth. "I'm sorry. 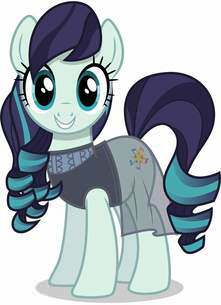 I just-" Coloratura consoled her, understanding completely the emotion the apple pony was feeling. "Thanks, Ra-Ra. You're right. I can still do this. We can still do this." Applejack rested her head on Coloratura's as they galloped alongside each other. Applejack took a short gaze at her friend, whose face was muddy, mane was in knots, and pelt had cuts and bruises. To the question of how she might go about finishing the race, she gave a valued response and tilted her hat forward. The vendor twirled his mustache at Applejack and snorted. "Oh and here I thought I had a lovely side business. You know you should consider honey dipped apples. They go great with tea." He would offer Hawke and any who wished for the suckers, and who delayed for the distraction, a free pop. "Oh no, no: no charge. I'm not evil as to deny my fellow racers a treat." Of course the Vendorcord did his job the actual racing pony was finding that stitch in his side spreading. He paused a moment to lean on a tree and wheeze. "Oh I'm getting to old for this." Reaching a hoof up to adjust his mane he would manifest a paper fan and trot along, said fan would be folded into a paper airplane by his magic. A note would be scribbled in before it was sent flying through the race, flashes occasionally emitting from it. He chuckled and trotted along. Colortura seems to have fallen into Pinkie's pace. Honestly that mare had more energy than he did in his pinkie! Ho ho ho! Oh now where was that paper airplane? Oh, perfect. His ears perked as he sought that wise load Taira. His hat had failed as a distraction, but at least he was close to the action. Beyond the race Discord seemed up to something or another. Which didn't seem odd in his case. His inane distractions aside he raced along like any other pony, bird, or fish! Mostly like a fish because this oxygen thing was hard!